I have been interested in geology since a child in the mid 1960's. In 1982 I received a bachelor's degree in geology, 1989 M.A.T. (Master of Arts in Teaching) in Earth Science. I worked as curator at the Museum of History and Science (now the Louisville Science Center) 1985 - 1993. Among my tasks while there, curating the Gerard Troost mineral collection (pre-1850 minerals) and acquiring the Tharp collection (1870's - 1950's). Today I work as an interpretive naturalist at the Falls of the Ohio State Park (world-famous paleontological site). My interests in minerals are broad. These days they include geode minerals, the IL-KY fluorspar district (and related minerals from other locales), calcite, fluorite, pegamatites, and self-collected micromounts. I have a large catalogued collection. Exchanging specimens is a favorite winter activity and I have a large stock of primarily self-collected minerals (and fossils). Sharing knowledge has always been a goal. That is why I have written articles for the Mineralogical Record, Rocks and Minerals and Mineral News. Uploading photos of minerals and localities as well as adding locality information is a way for me to keep this up. 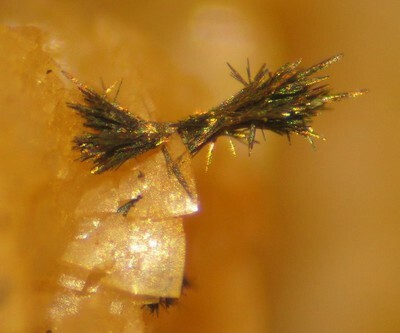 This page lists Alan's favourite minerals, localities and photos. All lists in alphabetical order. Alan has not added any yet. Alan Goldstein does not currently have any sponsored pages.